I have been doing so much sewing lately and each outfit ends up being pretty elaborate. I promised myself today I would do something simple. What do you think! Ok it started out simple enough. But then the little top said it wanted something different for the back. So I ended up with this. How cute is this!! 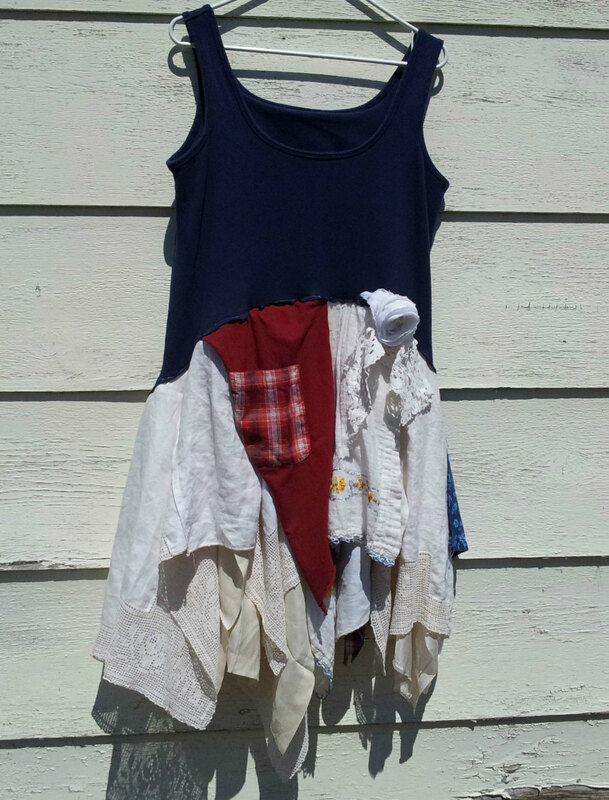 I took a white t-shirt a friend had given me and cut two inch strips and ruffled them. 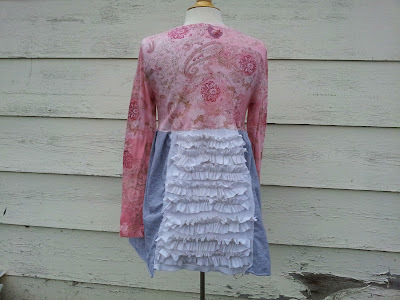 I cut another strip the length of the dress and sewed the ruffles on. I haven't done this before and thought it turned out pretty sweet. 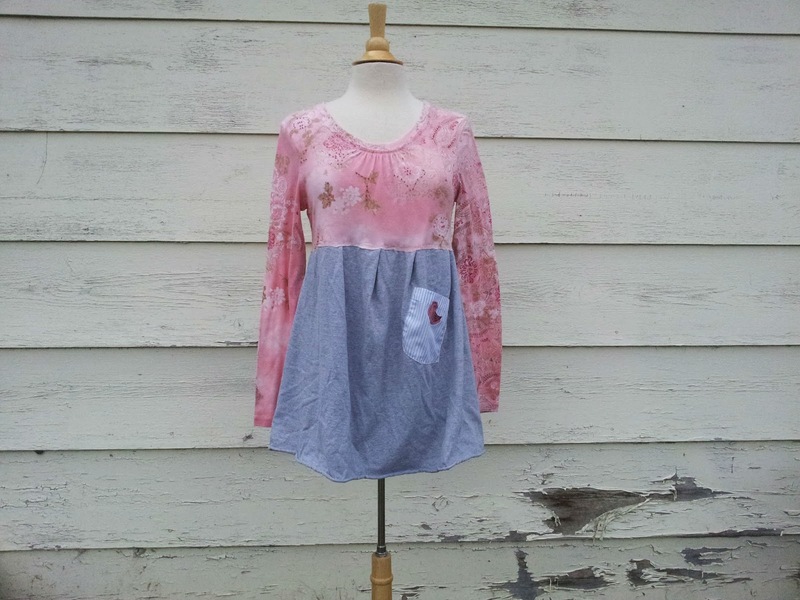 Teaching kids to sew is an adventure! For the last few years I have taught a few kids sewing classes during the summer. I always forget to take pictures and show how creative kids can be. Here is my group from this year. 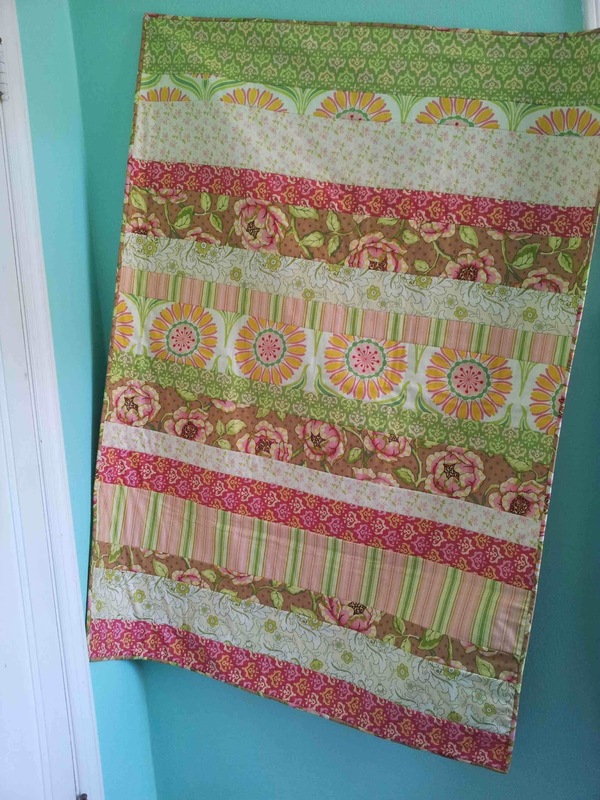 The quilt is a strip "quilt as you go" quilt. It is great for kids that are familiar with their machines and the ability to sew a straight line is a must. We did have a few dates with the seam ripper I'm afraid. I also feel this needs to be a 5 day class. We just can't get everything done in 4 days. The class was 3 hours long and trust me, that is enough for them. They really wear out after 3 hours. The class was taught at Hood River Sewing and Vacuum in Hood River, Oregon. If you need a new sewing machine or vacuum... this is the place! 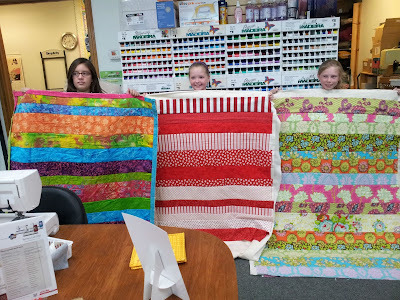 Here are my students from this year with their wonderful quilts. Batting: I use Warm and Natural crib size because you can leave up to ten inches unquilted. This is very important! We leave about 5 inches unquilted. 505 Basting spray and some newspaper to protect from the spray. Basic sewing supplies: pins, thread, hand sewing needle and thimble for sewing the binding. Lay out the batting on a large flat surface. Preferably on something larger than the batting. Line the batting around the edges with newspaper so the spray won't get on the floor or table. Lay the backing on top of the batting, right side up. If you have help this goes a little easier. Fold back the backing fabric about half way. Spray the batting with the 505 basting spray and gently lay the backing back down. Use your hand to smooth it as you lay it down. If you get a wrinkle, you can lift it back up and try again. Repeat on the other side of the batting. 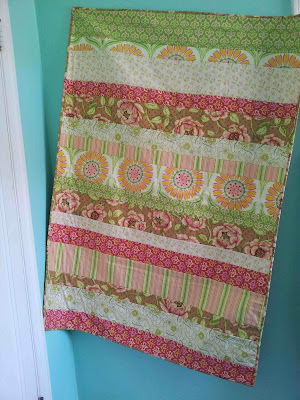 Cut each 1/4 yard of fabric in one of four different widths. One strip cut a 4" and 5" strip. Another cut 3" and a 6" strip. Cut from salvage to salvage and leave the salvages on. You will trim the quilt when you are done. Starting in the center of the quilt. Lay one strip face up. Lay another strip face down matching raw edges and pin. Sew from one side to the other all the way through the strips, batting and backing. Fold back the strip and smooth flat. Lay another strip face down matching raw edges and pin. Repeat until you get to the edge. Go back to the center strip and repeat to the other end of the quilt. Trim the quilt at the shortest strip. Cut six binding strips 2 1/4" wide and bind your quilt. 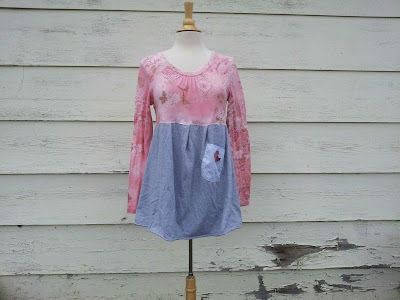 I made this little frock the other day and it seems to be a favorite view on my Etsy site. I even took it apart a few times before I felt it was just right. I so wish I could fit it it myself. It is made with a Tommy Bahama silk button up the front shirt and a women's green cotton plaid. 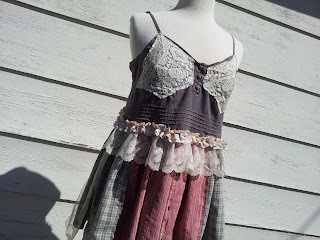 The top is a brown khaki cotton with some pretty vintage lace sewn down. I used another vintage lace and some silk ribbon for around the middle. I was so excited to get my second order from my Etsy store. A stranger this time. I feel like I might actually make it. Still tons of work to do to get noticed!!! But my customer also wanted another dress. She gave me free reign. (I hate free reign). I of course stressed big time. What if she didn't like what I made? These dresses look easy. 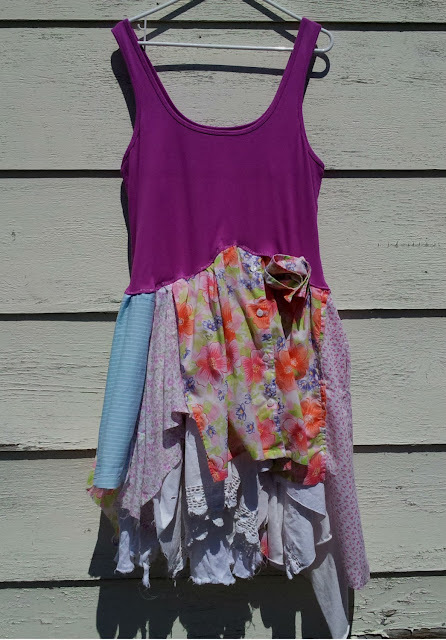 Just sew a bunch of scraps together. No such luck. There is at least 8 hours of hard work in each of these two. That doesn't count my date with the seam ripper..... twice. The blue one I actually tore down twice before I was happy. Here is the second one I made. I made a sweet little flower from the collar of one of the blouses used in the skirt. I thought it turned out pretty well. She liked the blue one. So the pink one is now available for sale!! !